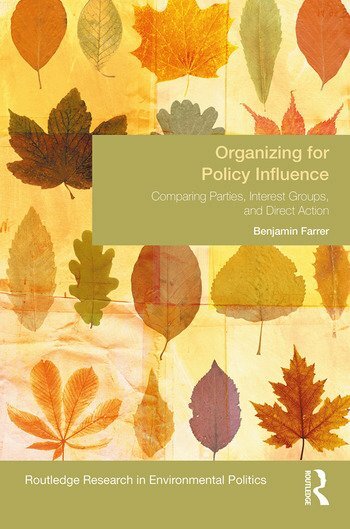 In this book, Benjamin Farrer explains how activists can influence the policies they care about, even when they are outnumbered and their issues are ignored. The solution lies in a surprising place: organizational choice. Different types of organizations will be more influential under particular democratic institutions. If they choose the optimal type of organization - given their institutional context - then even minority groups can be influential. Environmentalists are a key example of how small groups can sometimes punch above their weight. Environmentalists in different countries have made different organizational choices. These choices explain whether or not they succeeded in influencing policy. In the empirical chapters that follow, Farrer shows that environmentalists can sometimes be more influential if they form interest groups, but under other institutions, political parties are the optimal organizational choice. Although interest groups are often easier to create, national institutions can sometimes insulate mainstream politicians from niche interest groups. When institutions deny access to interest groups, activists are forced to send the stronger signal of party entry. Using a variety of methods, including a formal model, an experiment, and a wealth of empirical data from a variety of settings, Farrer proves that this theory of organizational choice adds to our understanding of several crucial phenomena. First, it helps explain patterns of political participation, by showing the importance of instrumental, rather than purely expressive, motivations for activism. Second, it provides an important modification to Duverger’s (1954) law, by showing that new party entry is a function not only of electoral rules but also of the rules that govern interest groups. Third, it extends research on the role of institutions in determining policy outputs, by showing that policy outcomes are a function of the interaction between organizational choices and institutional context. Benjamin Farrer is an assistant professor in the Environmental Studies Department at Knox College. His main research and teaching interests are in the field of parties and interest groups.